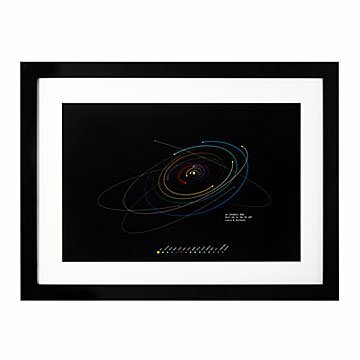 This print is a portrait of the solar system on any special date you choose. Mark a special birthday, anniversary, or Mars mission launch date in a cosmically novel way with this sophisticated portrait of the solar system. The international design team of Martin Vézina and Govy use down-to-earth data to create each custom diagram of the major planets and dwarf planets from your day of choice. They use the latest NASA information to precisely compute the positions and orbital paths of each celestial body. Mission accomplished? Not quite. They test their results against the Jet Propulsion Laboratory's systems to ensure the most accurate representation. All this amazing data is run through a 3D projection to generate a depiction of our galactic backyard unique to the date you requested. The print includes the Julian date (JD), from the calendar used by astronomers for a multi-planet perspective. No two different dates produce the same design, making this an elegantly personalized tribute to your place in space and time. Made in Oregon. Govy is an award-winning French artist living in Japan. She is a proud Autism Spectrum spokesperson and her Autism makes her strive for perfection in her work. Martin Vézina is a developer living in Canada, passionate about science, art, programming, and history. Martin needs to combine all these interests in the projects he undertakes to find fulfillment. Martin and Govy met through the magic of the internet, and together have built artistic visualizations of the solar system that express their common passion for space. I always try to find gifts that are unexpected yet people enjoy and this is one of those gifts. Bought it for my grandson. He is only 6 weeks old now so it hangs on the wall at my home. I'm waiting for the day he sees his name on it and that's when it goes on his wall. We bought this as a wedding gift for a family member. The bride and groom are both established professionals that have everything a newlywed couple typically request via a wedding gift registry. We wanted to give them something special, nerdy and personalized. This was perfect! It arrived without a scratch and the bride and groom were very pleased. To commemorate our own special day 13 years ago, we are going to have one made for us as well. Perfect gift to commerate a child's birth or any day of great importance. If you love to look towards the stars and appreciate our cosmic address..ie our solar system...order this artwork today! It is a "technical" piece of art with a lovely personalized addition. Such a fitting anniversary gift for my husband for 2 reasons....first, one of the songs at our wedding was "Bright" by Echosmith....lyrics include.... "I think the universe is on my side Heaven and earth have finally aligned" "Did you see that shooting star tonight? Were you dazzled by the same constellation? Did you and Jupiter conspire to get me? I think you and the Moon and Neptune got it right Cause now I'm shining bright" Second, we love all things celestial. Everyone that has seen this has marveled over what a meaningful and perfect gift this is for him! There was a slight issue with the delivery of the product, but it was quickly rectified. I was very impressed with the quality of the product and the fantastic customer service. What a special gift to give someone who truly appreciates the planets and space. This is a graphic print - nicely framed. Some science loving friends loved seeing the shape of the solar system at the time of their weeding. A very unique gift- in a world where unique is hard to come by.